Interesting setup with Harada getting a step closer to his goals. 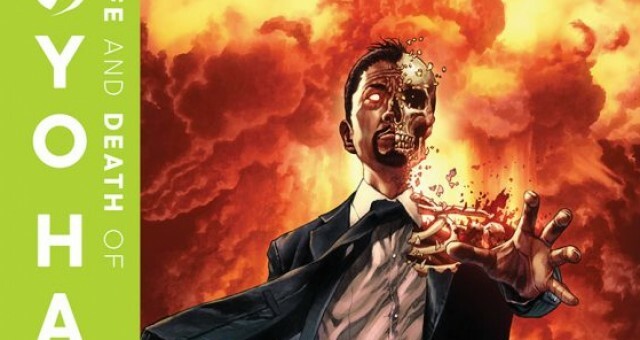 The Life and Death of Toyo Harada #1 is the start of a new series chronicling Toyo Harada’s quest to impose his worldview in the face of increasing threats. This issue opens up in Hiroshima, Japan in 1936. The man who would become the world’s most dangerous psiot was born into a typical Japanese family. His world changed in 1945 when the atomic bomb was dropped, and he witnessed his mother, and everyone around him, perish. After years of manipulating the inhabitants and events on the island, Harada makes a decision that it’s time he leaves. He kidnaps an American Lieutenant General and reveals what he’s been doing in the war’s aftermath. However, he understands that he can’t convince the lieutenant general of his actions, so he commands the lieutenant to distribute supplies equally between residents. Harada believes his role in life is bigger than taking care of the island. He explains how he’s going to learn how to stop humanity from warring against itself. But after 70 years of pursuing this goal, has Harada made things better or worse in the world? One of the many things I love about this character is the earnest way events around him are examined. It’s never black and white with complex issues presented in a simplistic manner. Similar to Harada’s physical appearance, some things are deeper than what the physical eyes observe. 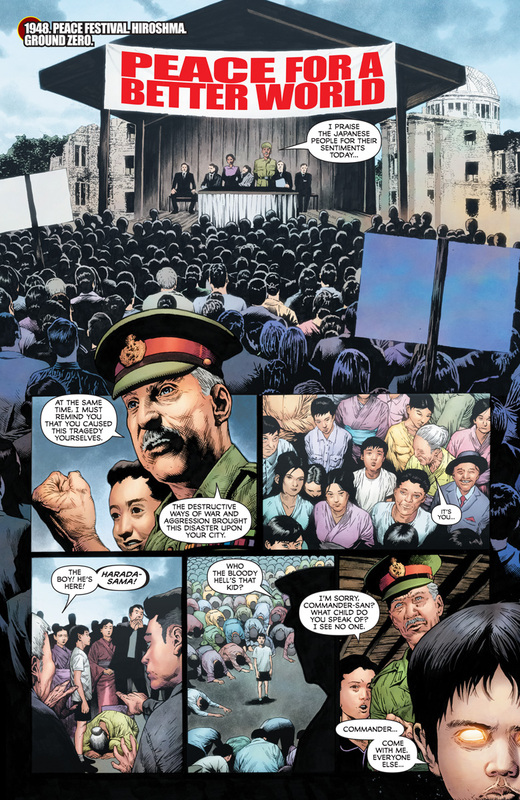 It’s easy to understand from Harada’s perspective his motivations to use his powers to create a world at peace. His tragic youth due to war, and his subsequent observations of the strong preying on the weak shaped his early actions. Yet the summary of the number of wars, resistance groups, terrorist groups, and refugees as a result of his actions paints a different picture. This issue focuses on Harada’s mission to build a space elevator that would allow him to access the alien technology debris in Earth’s orbit faster than any nation. For obvious reasons, an organization like Rising Spirit doesn’t want that nor does it care about Harada’s true motives. The CEO’s address to the State Council of China triggers an attack on Harada’s space elevator while Harada attempts to complete it. The action is entertaining and exciting. CAFU and Mico Suayan artwork is excellent in terms of displaying each character’s abilities enough to differentiate between the sequences. And the artwork was beautiful particularly in space. 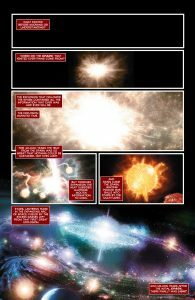 The story is evenly paced for a first issue. Dysart does an excellent job re-establishing Harada’s origin in the context of his current actions. Harada’s plan succeeding would have greater ramifications than anything Rising Spirit could achieve. There are a few smart twists, but again, that should be expected with Harada. And the character dynamics create just the right amount of suspense. The good thing is this issue set up enough intriguing story threads to maintain my interest. Now it’s just a matter of seeing where things go from here. 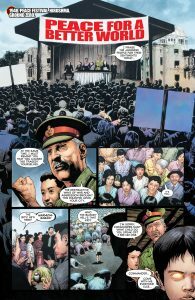 The Life and Death of Toyo Harada #1 is a solid start to this series. This issue takes an already fascinating character and adds another intriguing layer. There’s a lot of potential in this story line. Harada has big plans in terms of shaping the world by directly impacting the technological advantages and disadvantages. However, his team is almost at its breaking point due to internal pressure and worldwide pressure. And I can’t wait to see what happens next.